Tulips this tantalizing need no decoration! Celebrate a spring birthday, send your love, or simply let someone know you''re thinking of them with this stunning monochrome bouquet. Presented in a clear cylinder vase, the minimalist gift appeals to purple-lovers, tulip-devotees and those with a more elegant and simple sense of style. 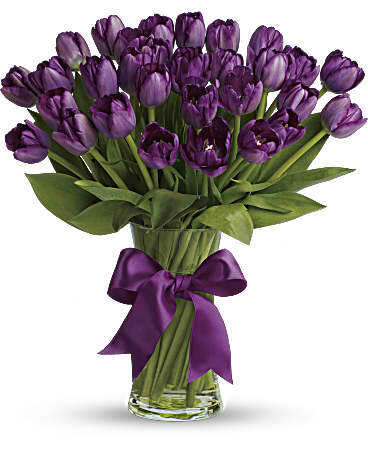 Ten deep purple tulips are gathered into a simple cylinder vase that''s tied with a bow. The clean design gets its refreshing green from the tulips'' leaves - no other greenery needed!